Technology. Business. TogetherWe are a group of IT professionals offering our consultancy services to customers. The unique blend of our competencies both in IT and in business functions and processes can help our clients meet the ever-stringent and dynamic needs of companies operating in highly competitive markets.We believe that today, more than ever, there is no IT solution without a specific business requirement, and there is no aspect of a business that cannot be improved upon without the implementation of adequate IT tools.Si around is built on the basis of Sinfo One's significant experience and Oracle Agile, a modular suite of applications, allowing customers to choose and implement the combination of modules that best suit their business model, existing systems and needs.Food & Beverage companies well understand that innovation is a key factor to maintain competitiveness in a market that is in constant motion. SI around is Sinfo One's solution for Product Lifecycle Management, a significant experience on Food & Beverage and CPG market. 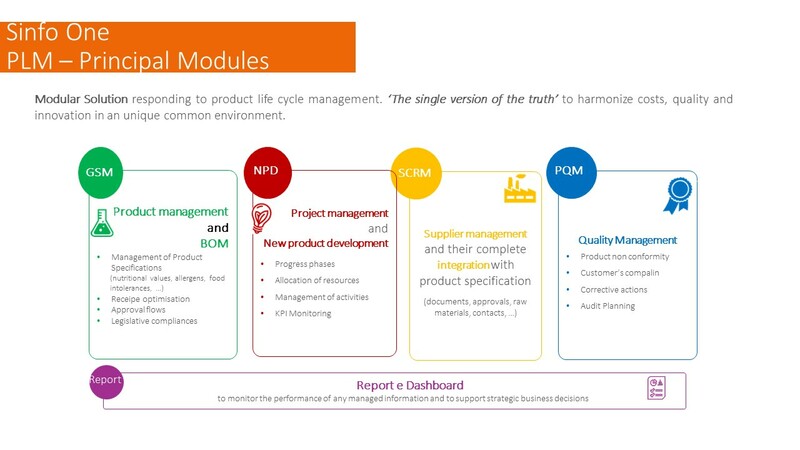 Sinfo One's significant experience on PLM allows to successfully complete implementation projects maximizing the benefits in terms of data capitalization, certainty of the information, reduction of innovation's costs, speed of introduction of new products on the market, reduction of risks for compliance. Moreover Sinfo One's knowledge of the specific market minimizes implementation time and costs.